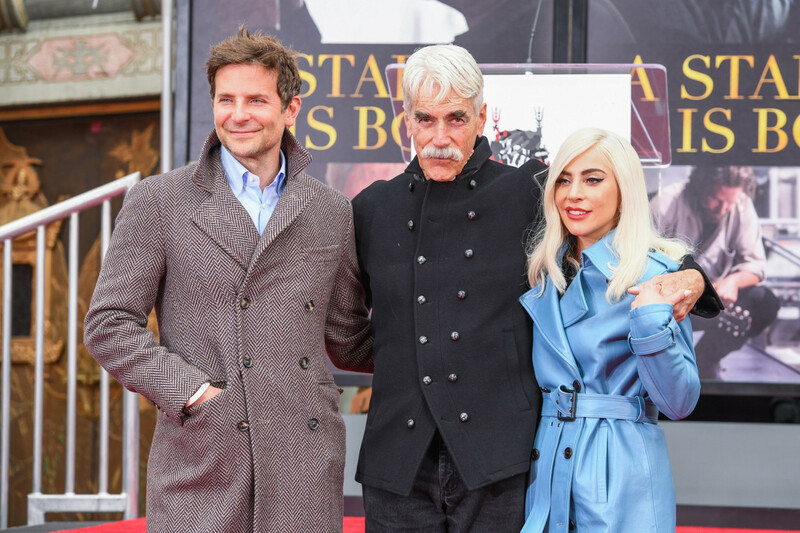 Veteran actor Sam Elliott imprinted his hands and feet in cement on Hollywood Boulevard on Monday, as "A Star is Born" co-stars Lady Gaga and Bradley Cooper shook off Golden Globes disappointment to join in honoring the 74-year-old's long career. Known for his lanky physique, thick mustache and languid drawl, Elliott reflected on his life's work and the joy of acting, telling reporters: "The people you work with, the community... and feeling like you're doing something that makes a difference to somebody" made it all worthwhile. "A Star is Born" may have struck out at the Golden Globes the night before, picking up just one trophy for best song, but Lady Gaga and Bradley Cooper were all smiles as they came to show their support for Elliott, who plays Cooper's elder brother in the film. Dressed in a striking sky-blue trench coat, Gaga, 32, shared an Instagram story as she received a kiss on her forehead from Elliott. "So excited to be here for Sam Elliott's hand & footprint ceremony," she wrote, adding a series of heart emojis. Elliott got his start with minor roles in late 60s Westerns such as "The Way West" ( 1967 ) and "Butch Cassidy and the Sundance Kid," but it wasn't until the 1980s that his career took off in a big way in the "Mask" and "Road House." He received the first of his two Golden Globe nomination for TV film "Conagher," where he played the titular role and starred alongside his wife Katharine Ross. Elliott also has two primetime Emmy nominations. His other notable works include "Gettysburg" and "The Big Lebowski," and he is a regular on current Netflix series "The Ranch." While he wasn't nominated at the Golden Globes, industry magazine Variety reported the actor seems poised to land his first Oscar nomination for what it called his "tender performance" in "A Star is Born."